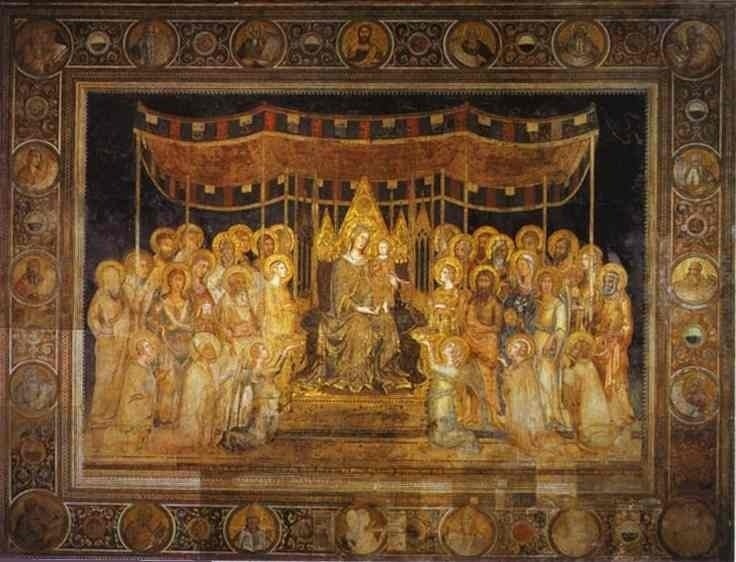 Giotto di Bondone painted the Ognissanti Madonna for the church of the Ognissanti (All Saints) in Florence. It was commissioned by an obscure religious order called the Humiliati, who were known for their humble, mendicant lifestyle. To support themselves, and their church, the Humiliati worked in wool production. They were well-known for using art to stimulate feelings of devotion. 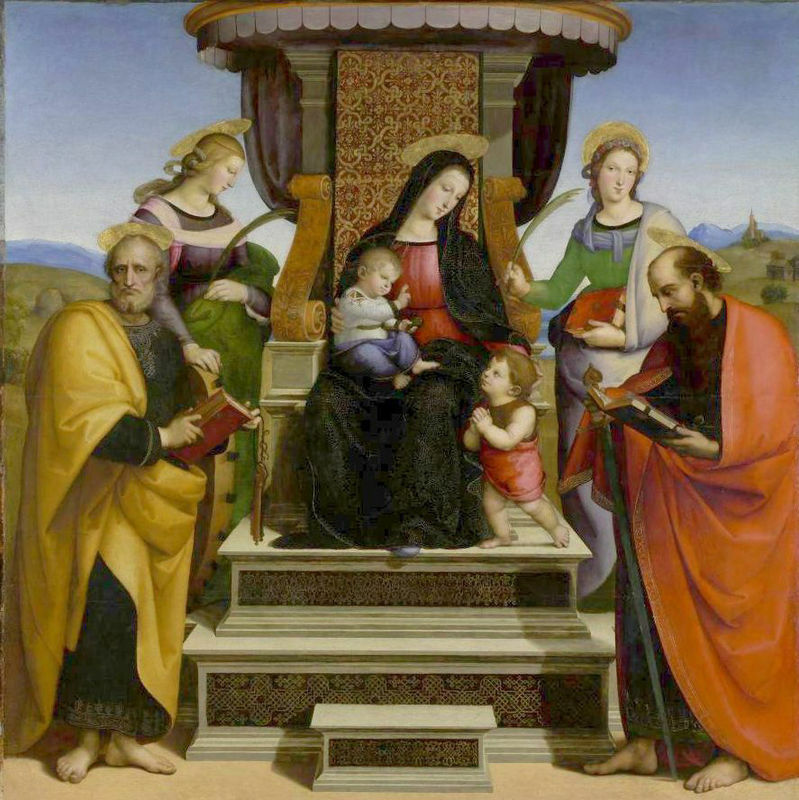 Originally, the Ognissanti Madonna was placed at the front of the church in Florence as an altarpiece. It is an enormous painting - over ten feet tall - and today is displayed in the Galleria degli Uffizi in Florence alongside similar works by di Bondone's contemporary, Duccio, and master, Cimabue. 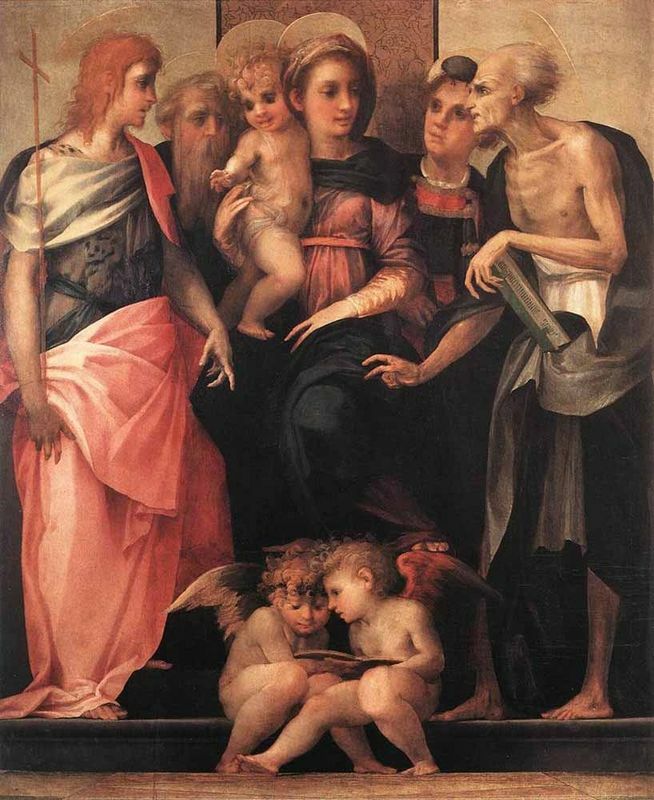 Di Bondone's Ognissanti Madonna was painted according to a common theme - the Maestà, or majesty - that features the Holy Virgin holding an infant Christ, surrounded by angels and saints on either side. The cult of the Virgin was incredibly popular throughout the Italian peninsula during di Bondone's time, its popularity reflected in the numerous Maestà paintings from the same period. The Madonna is regarded in art circles as having the same strength of representation as the frescoes at di Bondone's masterpiece, the Scrovegni Chapel in Florence. Inspiration for the Ognissanti Madonna was drawn from a theme common at the time, the Maestà, or majesty. This theme, which sprang from the immense popularity of the Holy Virgin, depicts an enthroned Mary holding an infant Jesus encircled by various angels and saints. The work, which was commissioned by a religious order in Florence known as the Humiliati, was intended to arouse sentimental devotion among the people and encourage church attendance and support. It is possible and even likely that di Bondone took cues from similar Maestà paintings by both Cimabue, his master, and Duccio, a contemporary and already-established artist when di Bondone commenced his career as a painter (se Related Paintings below). Both were solidly Medieval painters. Di Bondone's Maestà rendering, on the other hand, clearly shows what he is famous for: moving away from the stylized Byzantine method. The Ognissanti Madonna demonstrates his revolutionary naturalism and commitment to realism while simultaneously incorporating both Medieval and Gothic elements. The pointed throne, for example, is a classically Gothic touch. While the Ognissanti Madonna was clearly influenced by the work of di Bondone's contemporary Byzantine devotees, the overwhelming impression of the painting is one of striking realism and utter humanity. Di Bondone chose and arranged his subjects carefully. The oversized, imposing Madonna, the solemn, dignified baby Jesus, and the attentive, pious angels and saints at their feet are all equally crucial parts of the painting and, individually, seem to have a life of their own. Perhaps the most remarkable aspect of the Ognissanti Madonna is di Bondone's masterful use of color. With a traditional gold background, the gold of the angels' halos and gold lines along the throne, the painting seems to shimmer in a regal, holy light. The warm greens and reds, contrasted with the light pinks and purples, serve to humanize and lighten the otherwise weighty, ethereal painting. Texture plays a key role in the Ognissanti Madonna, especially in the faces of di Bondone's subjects. A scrutinizing look at the painting reveals the remarkably human-like texture of the flesh and the carefully nuanced facial expressions of awe, joy and respect. The clothing, too, demonstrates di Bondone's meticulous attention to detail. The thick, luxuriant robes of the Madonna fall realistically between her legs, the loose folds seeming to occupy real space. As he would do throughout his career, di Bondone sticks to naturalism in the Ognissanti Madonna. Eschewing the loose, flowing brushstrokes of the Medieval period, di Bondone paints his subjects and their surroundings exactly as they would appear in reality. The face of the Madonna features shadows and planes as though she were a real person sitting for a portrait. Gone, too, were the typically ambiguous or vacant expressions on the faces of the supporting characters. They gaze upward at the Madonna and child with faces of wonder and admiration (and a faint touch of fear). Little information exists on the immediate reception of the Ognissanti Madonna. It was commissioned by a group of poor monk-like men who wanted a powerfully moving altarpiece for their church in Florence, and few will doubt di Bondone's success in this endeavor. No evidence exists to suggest that the Ognissanti Madonna was not well-received by any part of society. Having already catapulted to fame for his work on the Church of St. Francis in Assisi, di Bondone was much in demand by both the papacy and lay community. 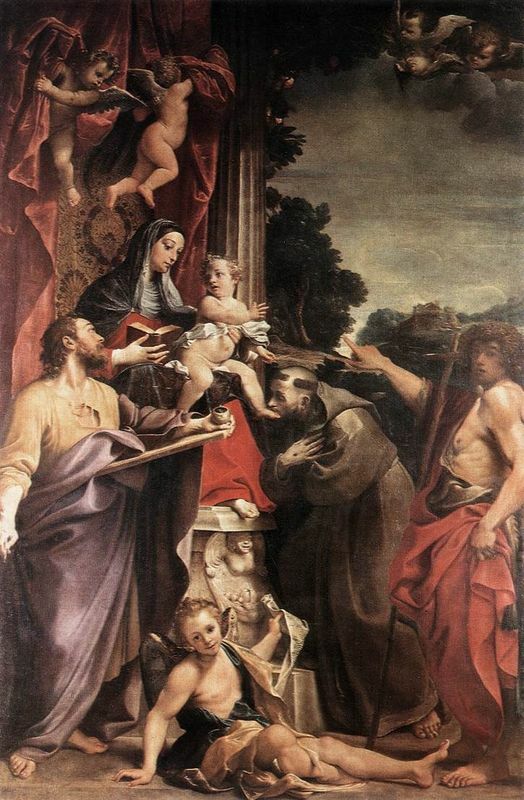 Furthermore, by the time of the Ognissanti Madonna, di Bondone's revolutionary naturalism was highly prized and beginning to be imitated by many artists throughout Italy. 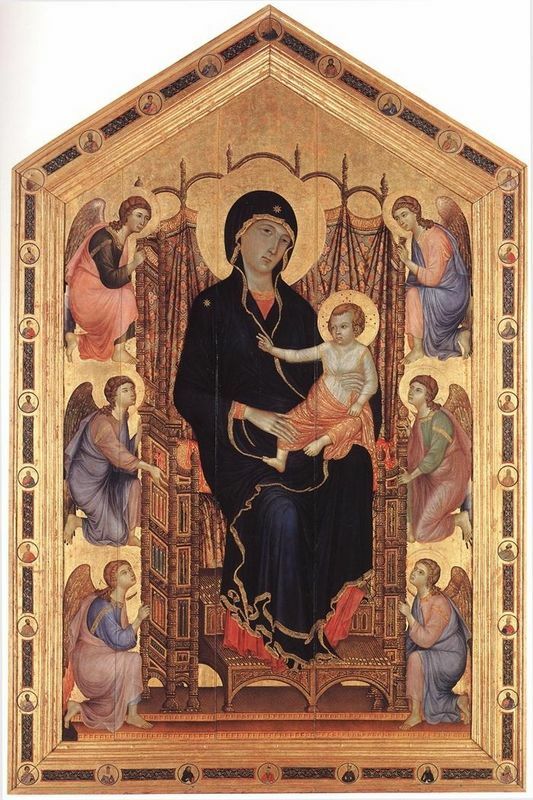 The Ognissanti Madonna, originally designed as an altarpiece for the Church of the Ognissanti (All Saints) in Florence, is one of very few remaining di Bondone works. Housed at the Galleria degli Uffizi (also in Florence) since 1919, it underwent a full restoration in 1991 and is currently displayed, appropriately, between two other Maestà paintings - one by Medieval painter Duccio and another by di Bondone's master, Cimabue. Though strikingly similar in some ways to both works, the Ognissanti Madonna is celebrated primarily for the ways in which it is different. It has stood for centuries and continues to stand today as evidence of di Bondone's invaluable contribution to the birth of the Renaissance. Because of the immense popularity, at the time, of the Maestà theme, there is no shortage of works similar to di Bondone's Ognissanti Madonna. In fact, it is displayed at the Galleria degli Uffizi in Florence between two other Maestàs by artists who heavily influenced di Bondone. Many artists throughout history have been drawn to religious themes and depictions of the Holy Virgin and baby Jesus, particularly during the Middle Ages. In medieval times, the religious community placed heavy influence on art as a source of congregants and, subsequently, financial support. 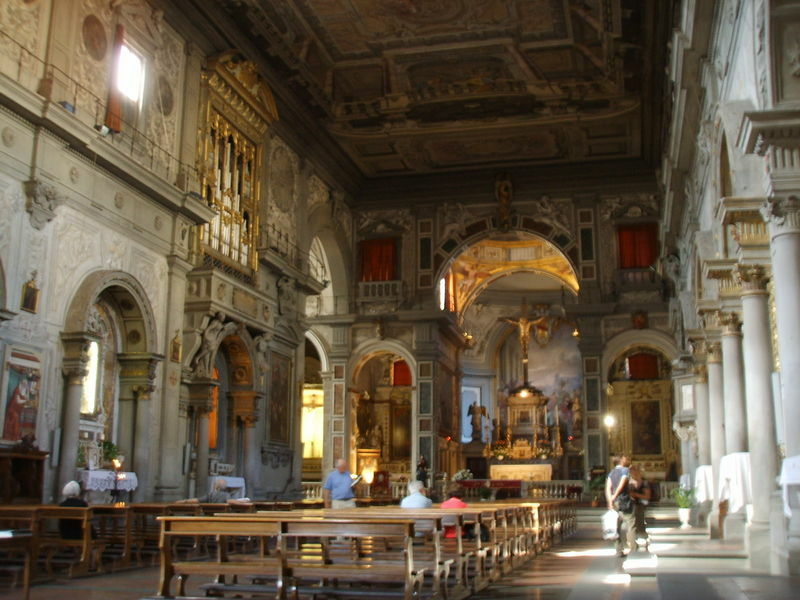 Often, churches that housed special works of art were granted special favor by the Pope, who had the power to decree that pilgrims making the journey to the favored church would receive indulgences for their effort. Indulgences, in Catholicism, means forgiveness for sins. The first Maestà painting at the Uffizi, a work of Medieval artist Duccio, was begun in 1308 and commissioned by the city of Siena for a cathedral altarpiece. While clearly more ornate and detailed than the Ognissanti Madonna, the themes are identical. The second Uffizi painting is attributed to Cimabue, di Bondone's master, and was intended as an altarpiece for the Church of Santa Trinita. Finally, a Maestà painting by Simone Martini, completed in 1315, bears an equally striking thematic and compositional resemblance to the Ognissanti Madonna. It is currently housed at the Palazzo Pubblico in Siena, Italy. 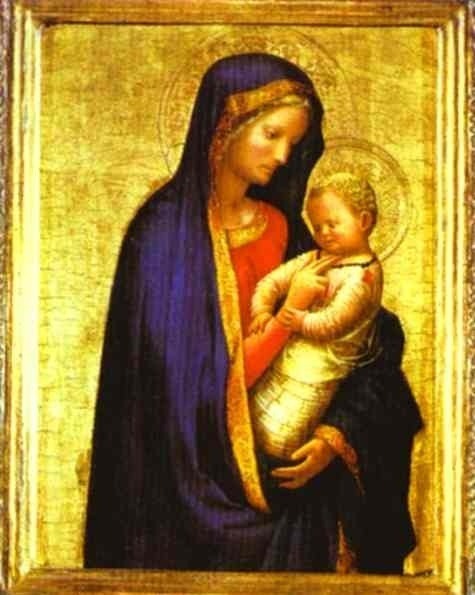 The Ognissanti Madonna was painted for and placed in the Church of the Ognissanti in Florence at the beginning of the fourteenth century. For hundreds of years it was very likely the object of study and worship for thousands of visitors and artists. 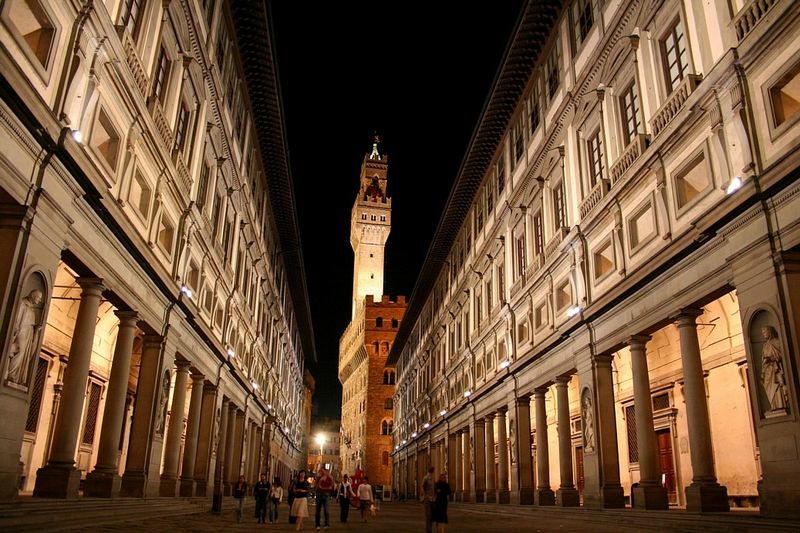 Records indicate that it remained at its original location in the Florentine church until 1919, when it was purchased by the Galleria degli Uffizi, also in Florence. Today, it is housed along with similar works by Duccio, Cimabue and other Italian masters. The Ognissanti Madonna was painted by Giotto di Bondone at the beginning of the fourteenth century and placed in the Church of the Ognissanti (All Saints) in Florence. Di Bondone's first recognized work, the frescoes at the Church of St. Francis in Assisi, catapulted him to fame throughout the Italian art world. Known for his revolutionary painting methods in which brilliant color and naturalism feature prominently, di Bondone later painted the world-renowned Scrovegni Chapel frescoes in Padua, Italy. 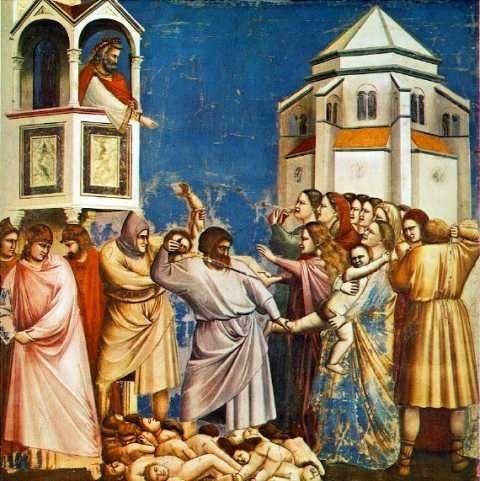 Di Bondone was born in 1266 in a small village outside Florence and was apprenticed to Italian master Cimabue until his own career took off. Throughout his career, he was extraordinarily popular with members of the religious community and was repeatedly commissioned to paint religious venues. He worked all over Italy during his lifetime, eventually settling in Florence at the end of his life to paint the Campanile at the Florence Cathedral. He died in 1337 at the age of 70. 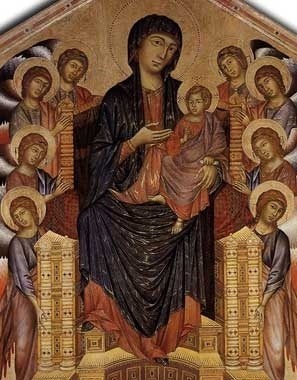 Giotto di Bondone painted the Ognissanti Madonna near the end of the Medieval period, which is why it features elements of the Byzantine and Gothic styles. At the time, religious themes were quite common among artists due to the overwhelming trend among the Catholic clergy to rely on art as a source of inspiration and devotion for their congregants. Di Bondone's entirely new approach to painting religious figures made him extremely famous and popular during his lifetime among the clergy; his use of vibrantly real color, light, shade and emotion made his work much sought-after by the church. Although the stylized Byzantine period was coming to an end, no other clear artistic movement had taken its place. Indeed, there would be only very minor movements and ambiguity in the art world until the Italian painter Masaccio took the next step and the Renaissance began. To learn more about Giotto and his artworks please choose from the following recommended sources.